Besoin de plus d'informations sur la réservation du logement 209282 ? This was our first time visiting Turkey so we were very unsure of which part to stay at. After reading the reviews from Garden Villas it then became our first choice. There was 7 of us, age range from 10yrs - 23yrs, plus 2 adults. On arrival Timur's brother was there to greet us. The villa was immaculate and very spacious, with everything you needed. Only things missing were mirrors in the bedrooms. which were needed when you have 3 teenage girls !! The pool was lovely, very clean. There was no shallow side though so young ones need floats. There were plenty of sun loungers, tables and chairs around the poolside. The location of the villa was spot on. Walk out of the villa turn the corner and there were all the restaurants, shops etc on your door step. We enjoyed very good meals in Amigos (staff there are very helpful and friendly). Also try The Chef... Excellent food and excellent value for your money. As for the night life, get yourself to BAR EX !! Brilliant night in there, staff were so funny, very entertaining and you also got served real drinks!! The beach was 3 minutes walk away, to hire sun loungers on the beach cost 5 lira, but you can haggle and get them down. It is a pebble beach so I would recommend wearing shoes that you can go into the sea with, also the fish in the sea nip at your legs (was a shock to us at first !!). ha ha. I would recommend taking English money there as the Turkish like this and you can get a much better exchange rate from any shop or even in the bars. I would also recommend the Jeep Safari, but be prepared to get very very wet !! There were 7 of us and it only cost £25 for a full day out. We also went to the water park in Marmaris which was very good value for money and another brilliant day. Overall this was the perfect holiday , very eventful and very relaxing. I would definitely recommend Garden Villas to everyone. Ok so this is a bit of a late review but definitely not forgotten how great our stay garden villas was September last year. After ringing numerous places trying to find a affordable place for myself, girlfriend, 1 year old daughter and motherror in law I gave Timur a call, who was very helpfull and informative. All we had to do was book the flights and pass on the details to him, he kindly organised for a taxi to pick us up from dalaman airport with a car seat for my daughter. When we arrived at the villa we were greeted at 2am by timurs brother who helped carry all of our luggage inside who also gave us a tour around. The villa was in immaculate condition we had 2 balconies with a large table and chairs, all the flooring was marble and tiles, full air conditioning in every room and new kitchen facilities. After a long flight (4 hours with a baby lol) it was relief to find we couldn't have chosen a better place to stay! the next morning we were greeted by timurs father who was very friendly to all of the family, he showed us around the garden which was beautifully maintained by the gardener every day, they even have a tortoise!!! And plenty of fruit trees. swimming pool.. had it all to ourselves, clean and new, perfect Icmeler: just outside the villa there is a restraunt called amigo where we spent most of our time, brilliant family entertainment. Beach: 2 minute walk or 10 secs on the quad bike :) So to sum up our holiday here was 10/10 thank you! 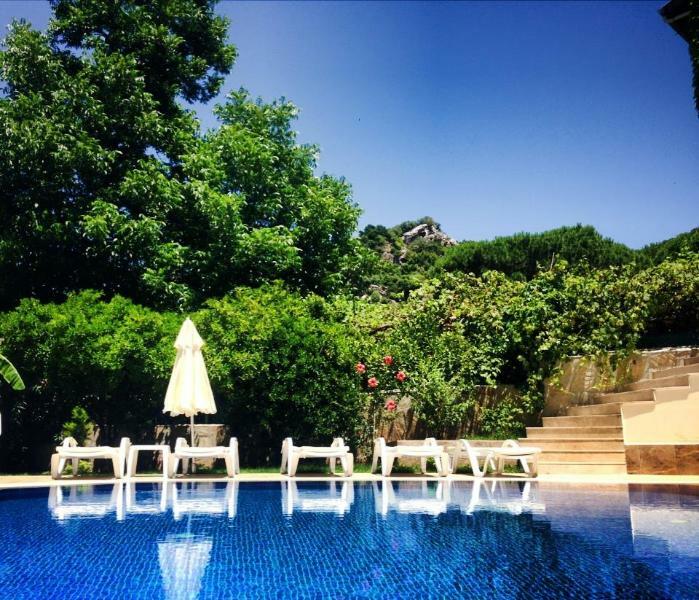 It was our first time in Turkey and it came as a very pleasant surprise. The scenery is stunning, the people delightful and the food varied, good and cheap. Icmeler is set in a beautiful bay surrounded by dramatic mountains, everywhere you look it is lush and green-something we had not expected . Garden Villa is tucked away in a largely residential area about five minutes from the beach and less than two minutes to bars/ restaurants. A car is not necessary public transport is frequent and reasonable, whether it be dolmus or water taxi which is great fun. Simply, but adequately furnished(the beds in particular were very comfortable) the villa was spotless inside and out. The real selling point however for us was the outside space where you got the impression a considerable amount of money had been spent. When you walked out the door you were met with a really beautiful view. An exceptionally large swimming pool, pretty landscaped gardens, comfy loungers, plenty patio furniture all wrapped up in a fabulous mountain backdrop. Laze around the pool all day, walk along the 9km promenade to Maramaris or go on one of the numerous reasonably priced boat trips(we went to Rhodes) you will not be bored. Finally I have to mention the owner who went out of his way to be helpful throughout the booking process. He forwarded lots of information on the area, suggestions for day trips etc and was only a phone call away should we have any queries. A caretaker was also available on a daily basis . I have booked many villas/apartments in the past but have never had such an efficient personal service. It was a delight to deal with him and I would not hesitate to recommend this villa to friends. The villa was ideal and well equipped. The gardens and pool are great, it is surprisingly peaceful given its location to all the bars and restaurants. The owners and caretaker have been exceptionally accommodating, which made our holiday all the more enjoyable. We stayed in the "New" Garden Villa for 11 nights. It was a great villa for us because the teenagers got their own floor with a separate key for access (and we got a floor to ourselves too). The pool area was lovely and the villa is ideally placed for access to the town - without being on the main thoroughfare. The owner was very helpful before and during our stay. The house is very convenient even with young kids (8 and 2). We all enjoyed the pool a lot and the garden is well maintained as well. Very close to the beach. Owner was very responding in adding equipment to the kitchen as it is basic for a self contained. We had a very relaxing time and a perfect weather. The villla is centrally based in Icmeler surrounded by a beautiful garden and a lovely pool which is ample size for the three villas that share its use, although if the other villas are fully occupied then there are not enough sunbeds for everyone, however the beach is only just a very short walk down the road. The villa is spacous with a large living room, with a bed settee, two chairs and another settee and the three bedrooms are of good size, the master bedroom has built in wardrobes, air conditioning, a double bed and a single bed, which would be useful if travelling with a small child, however if you are travelling in a mixed group it may be a little difficult with sleeping arrangements. The second bedroom had two single beds, air conditioning and a small balcony and the small room had a single bed and a wardrobe but unfortunately it did not have air conditioning, which in the height of summer made it impossible to sleep in, but there was also a put you up bed available to go in the living room if necessary. The kitchen was small but had a large fridge/freezer, toaster, kettle and a hotplate but no cooker, this was not a major issue, but there were times when it would have been nice to cook at the villa or to be able to have a barbeque but there was not one of those either unfortunately. The villa is not suitable for people who cannot manage stairs as there are a lot of them, but it wasn't a problem for us, but there is only really one bathroom upstairs, which did make it a little tricky when getting ready to go out as we had to take it in turns, however there is a downstairs toilet, which was handy when someone was in the shower. I have to say that the owner was very helpful throughout the booking process and it was a great pleasure dealing with him. I would consider returning to this villa in the future my family had a lovely time and the caretaker is very friendly too. Stayed in garden villas from the 27th June till 11th July and we had an absolutely lovely time. The villa could not be better located. Shops Restaurants bars and beach all within a 2 minute walk.No need for a car and just back far enough from the main entertainment area to be really peaceful. Villa is well equipped and has air conditioning.The owners were lovely and really went out of their way to help us have a great holiday.The pool area was lovely and spotlessly clean and well kept.We had a great time and the villa was perfect for us as a family. I stayed in the Garden Modern Villa with 6 friends from 25 June - 3rd July 2012. The villa was perfect for us and came equipped with a pool, air-con, two private balconies and a large outside seating area and garden. We were worried because we didn't have a car but the villa was within 2 minutes walk of the main road of Icmeler where all the restaurants, shops and bars are. Our villa had a large kitchen and lots of communal spaces inside and out, perfect for our group. The villa owners were fantastically accommodating and welcoming and gave us lots of advice and assistance. The villa is surrounded by high green mountains and the garden has tortoises. At night the pool was lit up and we ate outside most evenings. Icmeler itself was quite busy (much quieter than Marmaris but still lots of places to eat, drink and dance in the evenings) but the villa was tucked away from the noise. The local beach is popular and is quite crowded with lots of sunbeds. We found a quieter beach round the corner (keep walking past the harbour) which was lovely. Overall I couldn't fault this villa for price, location or comfort. Vous pouvez prendre contact avec Timur (le propriétaire) grâce au formulaire de contact sur cette page. Envoyez un email à Timur (le propriétaire) à l'aide du formulaire de contact situé sur cette page. S'il y a un numéro de téléphone sur l'annonce, vous pouvez également contacter le propriétaire directement. Comment contacter Timur (le propriétaire) ? Vous pouvez prendre contact avec Timur (le propriétaire) grâce au formulaire Contacter le propriétaire sur cette page, pour obtenir un devis ou poser vos questions. Si vous utilisez le formulaire Réserver pour verser un paiement provisoire en ligne et envoyer une demande de réservation à Timur (le propriétaire), le propriétaire a 24h pour vous faire savoir s'il accepte votre réservation, auquel cas votre compte sera débité du montant prévu. Vous pouvez demander un devis à Timur (le propriétaire) grâce au formulaire de contact. Le propriétaire vous enverra le prix total pour les dates qui vous intéressent et un lien pour réserver en ligne. Pourquoi ne puis-je pas téléphoner à Timur (le propriétaire) avant d'avoir réservé ? Vous devrez contacter Timur (le propriétaire). Envoyez un message sous la rubrique Gérer vos réservations ou par le biais du formulaire de contact sur l'annonce. Pour modifier les dates ou le nombre de personnes de votre réservation, vous pouvez envoyer une demande depuis la page Gérer mes réservations. Pour modifier les dates de votre séjour, cliquez sur Modifier la réservation. Pour modifier le nombre de locataires, envoyez un message au Timur (le propriétaire). Si Timur (le propriétaire) est d'accord, il vous enverra un nouveau devis correspondant aux modifications. Vous pouvez le consulter et l'accepter ou le refuser depuis la page Gérer mes réservations de vacances. Vous aurez 48 heures pour agir avant que le devis arrive à expiration.